First the cane has to be split and cut to length. It’s best to split the cane first and then cut it to length. After the cane is split, it is much easier to locate the flat and straight parts of the cane. Each tube is split into four sections. Before splitting the cane examine it for symmetry and decide where the best divisions should be. Once the cane is split examine each length and locate the straightest and flattest sections. A strip of cane that is long enough to yield two or three reeds often only has enough prime material for one reed. A traditional reed is 68mm in length. I cut mine to 70mm to allow for material I will remove later during the clipping process. 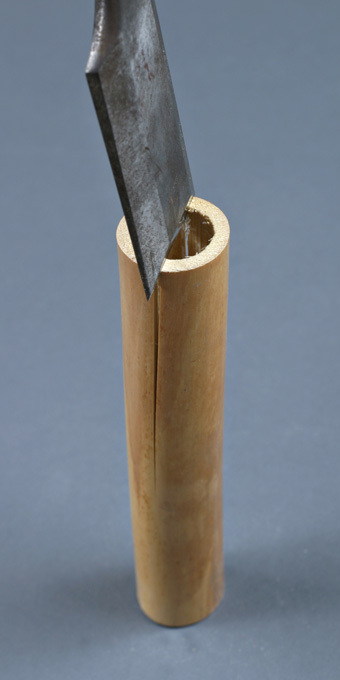 To cut the cane to length it’s easiest to use a cane guillotine. 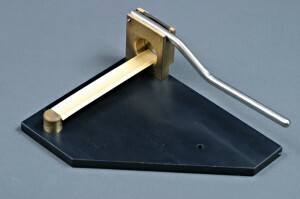 A bassoon guillotine can work for clarinet, but sometimes they are not up to the task of cutting thicker walled cane. Another option might be a miter saw designed for wood working, like the one here .